We are dedicated to alleviating extreme rural poverty, protecting the environment and conserving wildlife in rural northwestern Cambodia. MJP was founded in 2003 as a conservation and community development program in the Samlout Protected Area. Our aim was to provide support to rural local villages and help protect endangered wildlife and forests. Our first task was a landmine clearance program to help clear contaminated areas of the countryside in one of the areas of the country most affected by conflict. In 2006 the MJP Program expanded its work to include projects in agriculture, education, gender equality and healthcare. (Photo: Angelina and Maddox in the early years of the MJP Foundation). Our ethos is to support Cambodians as they develop their communities and protect their natural resources. 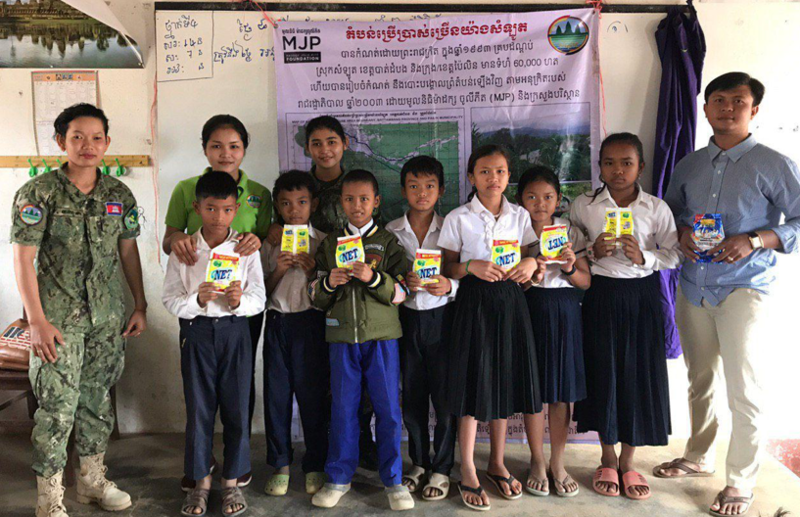 Working in remote, post-conflict communities, MJP helps vulnerable families in rural communities to meet basic needs and access services in health and education. As we have grown, we have worked hard to ensure we consider all aspects of rural community development. Support for women’s empowerment is also a central component of everything we do, from agriculture to education. The Cambodian Government declared Samlout a ‘Protected Area’ in 1993 to support long-term conservation of its wildlife and ecosystem. The area comprises approximately 60,000 hectares of land near the Thai border. It contains most of the regions biodiversity, with forests, freshwater ecosystems and a variety of endangered species. However, wildlife poaching, mining and land grabs continue to pose a significant challenge. MJP works in partnership with the local authorities as they seek to protect the land, wildlife and forests. Over the last decade we have combined our local skills and knowledge with other organisations and government to promote and improve the health and livelihoods of the rural communities, wildlife and forests in the Samlout Protected Area. We work in partnership with local communities to provide employment opportunities across all of our projects. With our partners we have built two health care centres and a maternity ward, as well as a kindergarten school and library. 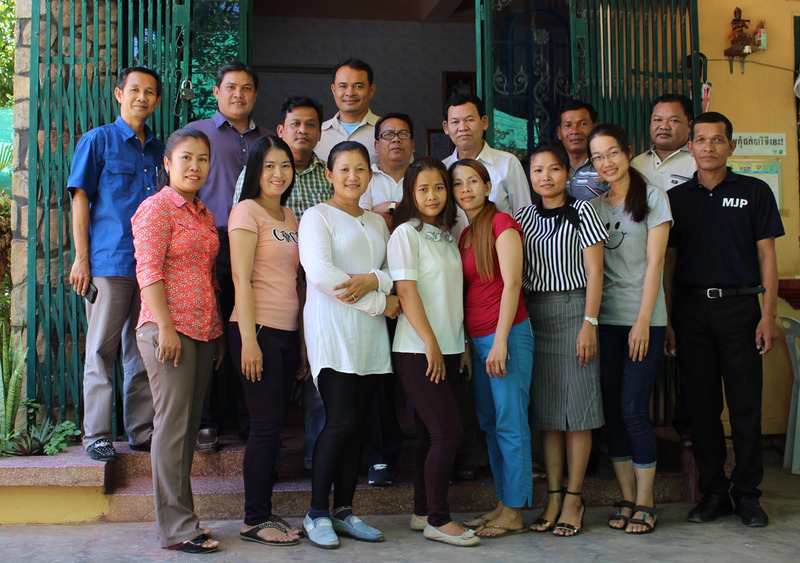 The MJP Foundation is a team project, locally run by Cambodia staff and for the people of Cambodia. We are 100% Cambodian. Most of the MJP team live in local villages. This enables us to directly interact with all the communities. The MJP office is based in Battambang and our field office is in Samlout. Angelina Jolie first visited Cambodia in 2000 when she made the film Tomb Raider. She was struck by the beauty of the country and the resilience, graciousness and warmth of the Cambodian people. A year later she returned with the United Nations Refugee Agency (UNHCR). In 2003 she set-up the Maddox Jolie Program that is today the Maddox Jolie-Pitt Foundation (MJP). Deforestation is a major problem in Cambodia. The last intact tropical forest in northwest Cambodia is threatened by illegal logging, land encroachment and poaching. MJP works with local communities and the Ministry of Environment to help conserve this vital ecosystem, rich in biodiversity. 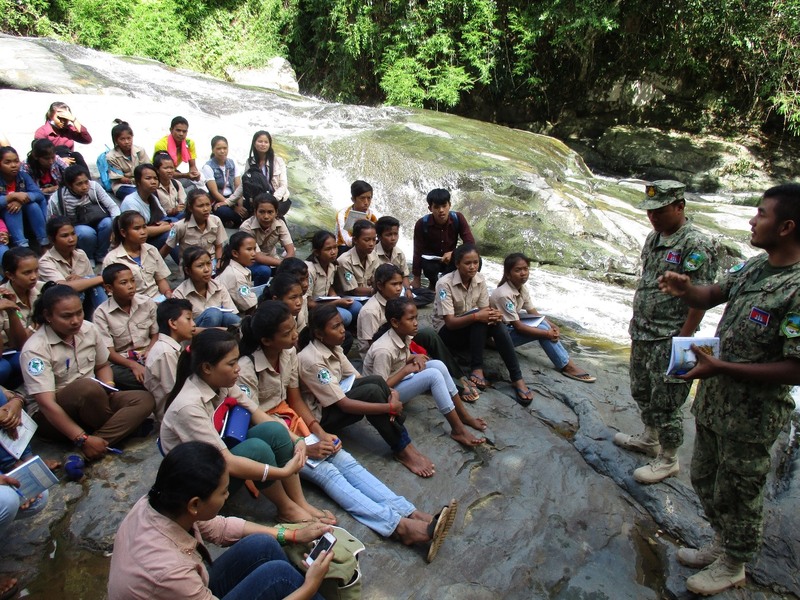 We fund a team of local rangers, and work with schools to educate children on protecting their natural environment and share environmental knowledge. Access to schools and trained teachers is still limited in rural Cambodia. MJP works with teachers in ten primary and secondary schools to improve education, teaching and school facilities. We have renovated and furnished ten school buildings in Samlout. Our education program has helped 15,000 students, equipped classrooms with textbooks, provided mobile libraries, and developed literacy classes and reading clubs. Some 80% of the population in Samlout live below the international poverty line and personal debt is a major issue. MJP’s locally-run micro-credit project provides small loans and financial advice to the poorest households in seven villages. We help individuals and communities to manage their finance with interest-free loans, support and training. 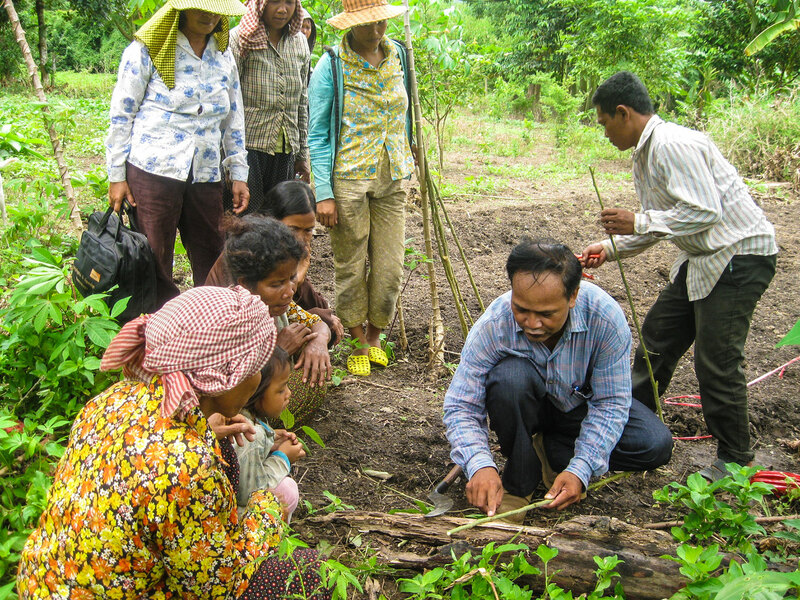 Around 80% of the rural population in Cambodia works in agriculture. Levels of poverty are high and access to safe and nutritious food is a problem for many families. Improving food security and nutritional wellbeing is central to MJP’s poverty reduction work. We provide practical training to farmers and the community to help them make the best use of their livestock, land and resources. MJP is committed to empowerment and equal rights for women and girls. We work with local women’s representatives to organise gender awareness campaigns against domestic violence and human trafficking and to promote positive health practices. We help to provide vocational skills training for the most vulnerable girls, and additional support for the poorest female-headed households. MJP helps provide sustainable healthcare to the local community through two clinics, a maternity ward and training and outreach, working in partnership with local authorities. Our work includes maternal health, reducing child mortality and undernutrition, eye and dental care, hygiene and sanitation guidance, and training for teachers and young mothers. Cambodia has a rich history that dates back to the Khmer Empire in the early 9th century. The monuments of Angkor Wat and Bayon are testimony to the Empire’s immense power and wealth, diverse art and culture. The history of Cambodia is overshadowed by the rule of the brutal Khmer Rouge regime, which resulted in one of the 20th century’s worst human atrocities. Between 1975 and 1979 the Khmer Rouge regime claimed the lives of nearly a quarter of the Cambodian population. Cambodia still bears the legacy of that difficult past, but is a country of immense beauty, resilience and promise for the future. Cambodia is one of the poorest countries in Southeast Asia, and one of the least developed countries in the world in terms of access to food, health and education. The majority of Cambodians live in rural areas. According to the World Bank 79% of the population do not have access to piped water supply and 58% do not have access to sanitation. WHO data indicates that Cambodia continues to make in raising living standards, maternal health, early childhood development and primary education programs in rural areas. Cambodia is one of the most heavily mined areas in the world. Landmines have killed or maimed thousands of people nationwide. De-mining is a crucial part of reintegrating people after the long-running conflict. Development has been hindered by millions of landmines laid in the 1970s and 1980s, that still lie throughout the countryside. Landmines currently contaminate an area of approximately 1,700 square kilometres in Cambodia. As well as threatening lives, landmines limit development by restricting access to land, water, roads and health and education services. Cambodia is blessed with natural resources and is one of the most bio-diverse countries in Southeast Asia. Its forests are home to several endangered species that have disappeared from neighbouring countries. But this rich environment is under threat from logging, mining, poaching and agricultural encroachment. 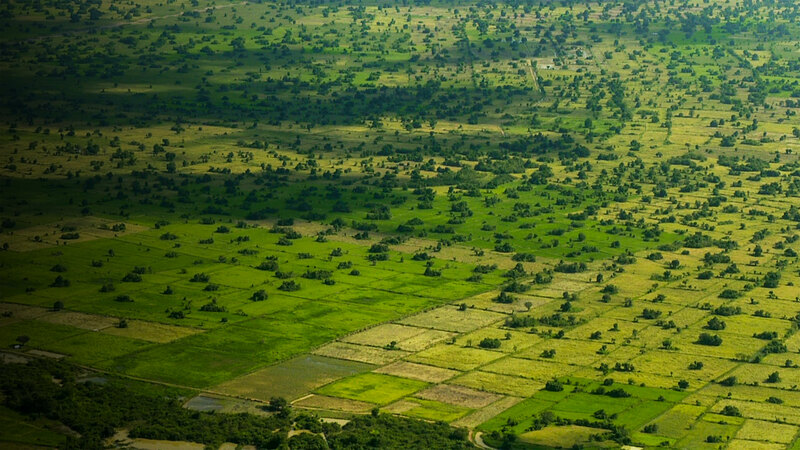 Further loss of the forests and natural habitats would harm or destroy wildlife and affect millions of people living in remote areas who rely on the land or its resources. Conservation is essential for rural livelihoods and the preservation of the diverse eco-system. 26-year-old Am Channuon is the newest member of the MJP ranger team helping to protect the forest in Samlout. Ever since she was a young girl she has been passionate about the environment and dreamed of becoming a Natural Resource Protection Ranger. After months of training, she has now reached that goal. She is one of 38 MJP rangers (including 4 women) and she is the only woman in her team of 6 rangers. As a ranger, she carries out field patrols to counter illegal poaching and illegal logging in the Samlout forest. She also shares her environmental knowledge with the local villagers and students, holding environmental awareness training sessions to explain the importance of protecting natural resources. On becoming a ranger she said: “I really want to see more people involved in protecting the environment, to keep Samlout green, and to increase the wildlife populations for the next generation”. 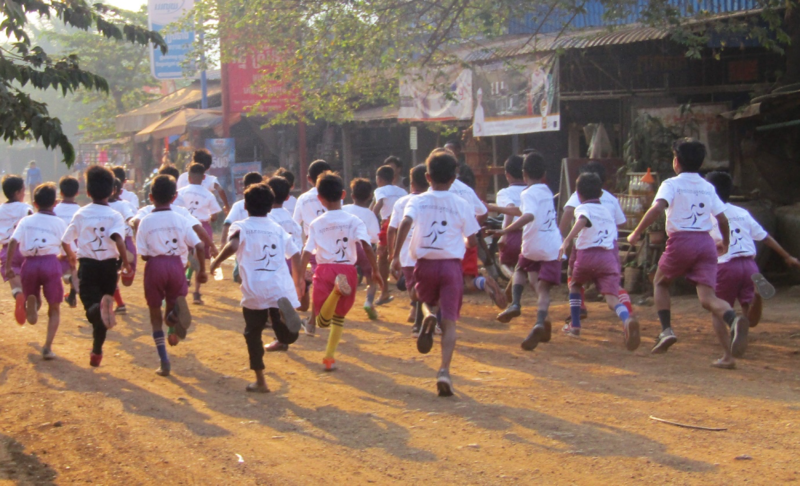 On January 24, MJP organised the ‘Samlout Community Health Festival and Run’ in order to promote the benefits of regular exercise and healthy living. Over 300 students from the local Sre Andong secondary and primary schools took part in 2km and 4km races, designed to encourage the children to participate in sports. As part of the health festival, MJP organised health checks and a quiz to help inform and educate young people about non-communicable diseases, such as diabetes. The event brought the whole community together. One of the young runners, 15-year-old Sam Ang Munineath who is in grade 9A, said that the event “made learning about health fun”. In light of this success we hope to make this an annual community event. See you next year! Last month, Moen Sokna successfully passed his grade 12 exams and graduated from Samlout High School. He is the first recipient of the MJP Shiloh Scholarship. This is a huge achievement for Sokna. Both his parents were killed in a landmine accident after which Sokna and his brother abandoned their studies and dropped out of school. But with support and help from MJP, Sokna and his brother returned to school. 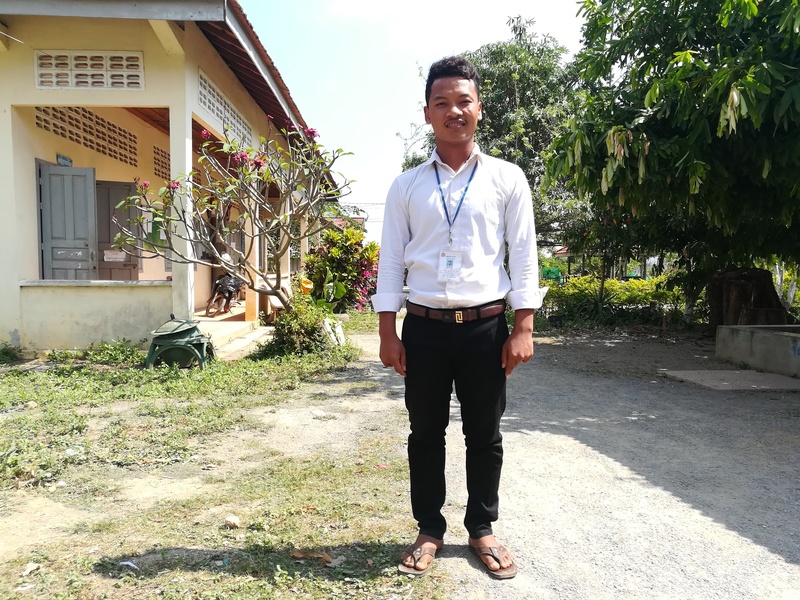 Upon graduating Sokna said: “when I was a small boy, I didn’t expect to study after grade 8 because I was a village-boy from a poor family, but now my future is brighter”. He plans to train to become a teacher and help other children in Samlout gain an education. Sokna’s brother Samphos is still supported by MJP and attends Samlout High School. 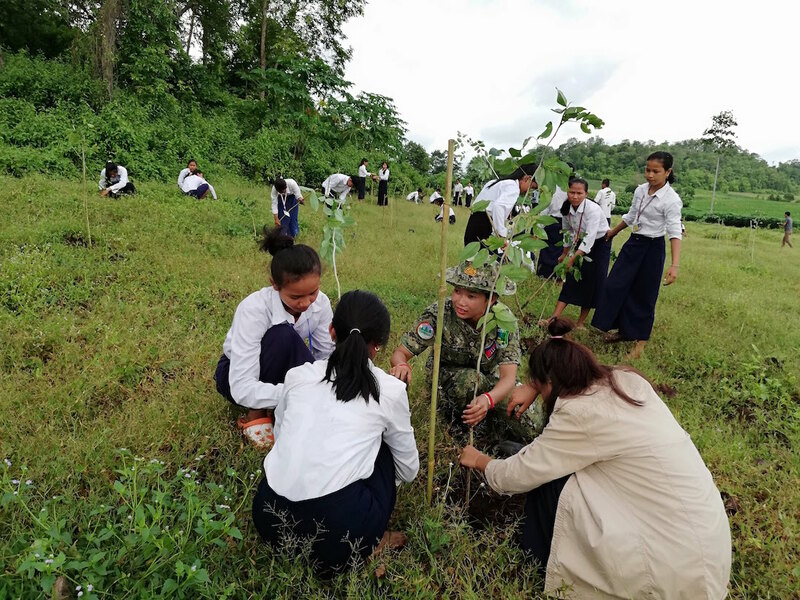 To celebrate World Environment Day, MJP and members of the local community planted nearly 2,000 new trees at the Chrab Krahorm pagoda, Meanchey Buddhist commune in Samlout. 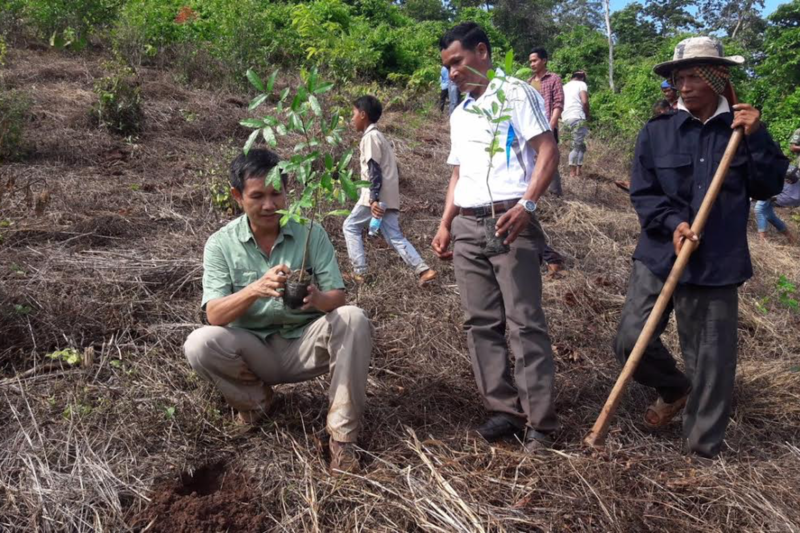 Over 200 local villagers, students, teachers, monks, forestry officers and MJP staff spent a day together planting new seedlings to help regrow an area of the forest which had been cleared for illegal logging of timber. We are working with the local community to help tackle deforestation and promote the importance of protecting the environment. We hope that more tree planting days will be held in other communities in the district to help maintain the endangered forest in Samlout. This month we have helped local villagers gain new skills in beekeeping, which can be used to set-up their own small businesses. 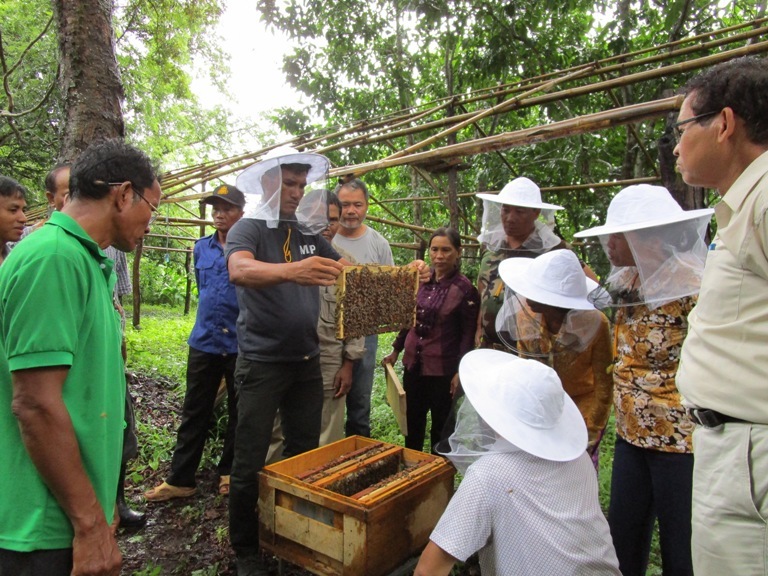 In partnership with the Cambodian Natural Agriculture Skill Training Organisation (NASTO), MJP provided three days of technical training on farming and raising bees for the production of honey. One of the women participants said that she used to collect honey from the forest to sell, but it was very dangerous because of the unexploded land mines. Now she can safely produce and sell the honey. The local villagers are keen to expand their new network and form a beekeeping association in Samlout district. Copyright © MJP Foundation. All rights reserved.